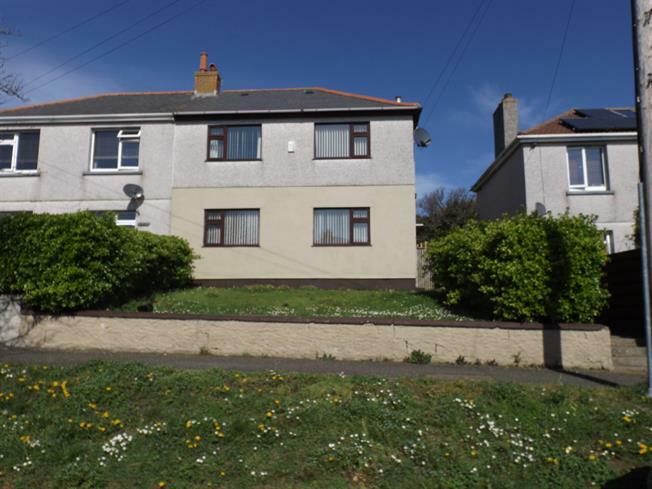 3 Bedroom Semi Detached House For Sale in Newquay for Asking Price £210,000. This modern semi detached three double bedroom house with lounge, dining room, kitchen/breakfast room, reception hall and bathroom, has gas central heating and uPVC double glazing. Outside there are front and enclosed rear gardens. Viewing is recommended - Chain free. UPVC double glazed entrance door. Radiator. Stairs rising to first floor landing with uPVC double glazed window. Doors into under stairs airing cupboard and lounge. UPVC double glazed window to front. Mains gas fire. Two uPVC double glazed windows to rear, and door gaining access to rear garden. Fitted kitchen units comprising four wall cupboards, five base units and three drawers, with roll top work surfaces, inset stainless steel sink and drainer with mixer tap over. Breakfast bar. Radiator. Radiator. Access into over head loft space. Doors into three bedrooms and bathroom. UPVC double glazed window to front. Radiator. Wash hand basin. UPVC double glazed window to rear. Radiator. Wash hand basin. Incorporating panelled bath with glazed shower screen and shower over, low level flush WC. UPVC double glazed window to side. Radiator. The front garden is laid mainly to lawn with footpath leading to the front door and to the enclosed terraced rear garden.